Are all locations independently owned? Do you want all complaints for the entity mixed together or separate? Do you want all reviews for the entity mixed together or separate? If locations are not independently owned and you’d like to have all reviews and complaints aggregated together, you’d want to create just one listing. You can have one listing for the main location / HQ. There’s a tab that says “Find a Location” on the main listing where you can list your other locations but these don’t actually link to any listings. It’s just a list in a pop-up window. Pros: It’s way easier to manage just one listing, especially if you have thousands of locations. BBB does have a bulk upload option via spreadsheet but it has to be manually uploaded and reviewed by hand. Cons: Reviews and complaints from all locations are mixed together. So if you have one rogue location that has been misbehaving, it can bring your overall rating down. Also, each location does not have their own individual listings that can rank in the SERPs. If locations are not independently owned and you’d like to have all complaints aggregated together, you’d want to create a listing for each location including one for the HQ. You can have one listing for the main location / HQ and separate listings for all the other locations. There’s a tab that says “Find a Location” on the main listing where you can list your other locations. Once you open the “Find a Location” window you’ll see an option for “Additional Information”. This links to each locations indivudal BBB listing. Each of these has the ability to have their own reviews. Pros: It’s way easier to manage just one listing, especially if you have thousands of locations. BBB does have a bulk upload option via spreadsheet but it has to be manually uploaded and reviewed by hand. Each location has it’s own listing and reviews so each one can rank in the SERPs. Cons: Complaints from all locations are mixed together. So if you have one rogue location that has been misbehaving, it can bring your overall rating down. 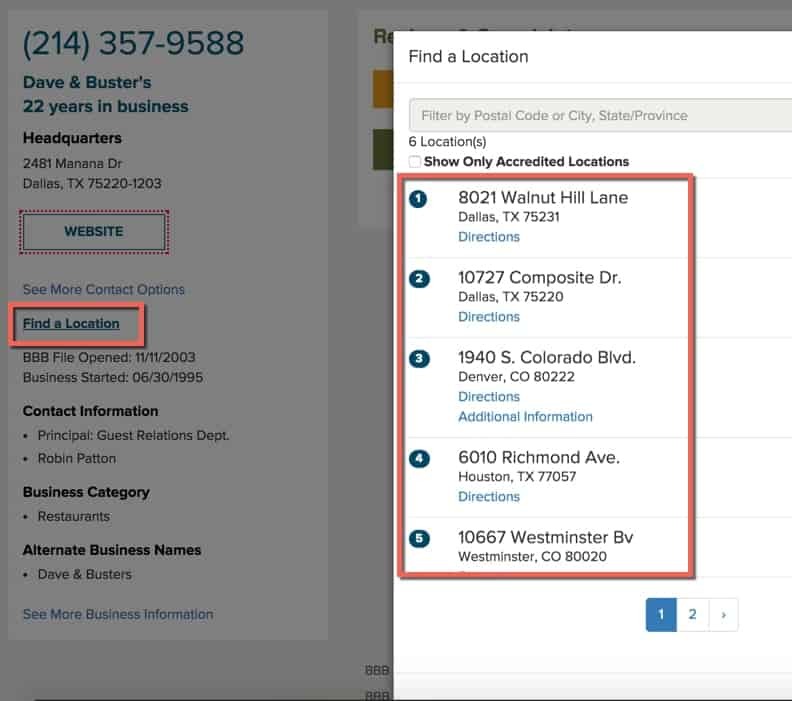 If each location is independently owned and you don’t want reviews and complaints from all locations mixed together, you could create a BBB listing for each individual location. Pros: Each location can have its own listing show in SERPs. This could include review stars as well which is a major plus. Cons: BBB does have a bulk upload option but this would not be allowed in this scenario. Creating and managing listings manually for each location can be a pain. It would just depend on how many locations you have. I was hoping there was a way to get around this for marketers that deal with co-op marketing because it would be easier to manage in bulk. However, if they’re independently owned and have a co-op marketing initiative, they still need to have separate listings. Have you made your decision on how you will structure your BBB listing(s)? Keep in mind, you don’t have to be accredited in order to get listed on BBB.org. Once you are ready, you can use my Citation Cheat Sheet to see how to add or edit your BBB listing(s) for free without paying for accreditation. This should help make the process easier. Update: I spoke to someone at the BBB and they were kind enough to share some more information on this topic. There are over 100 Better Business Bureau offices all over the country. Each office is somewhat independent and can choose how they handle certain policies and this can also depend on the resources they have. Some offices are large and some have as little as three employees. So if you speak to two different BBB offices, you might get two different responses. This is important to keep in mind if you are working with your local BBB. If you have any trouble with managing your BBB listings you can call an operator at your local BBB. Just tell them that you want to correct your listings and they may be able to help you out.